LF KF750 Secret has got a very sleek and stylish look. 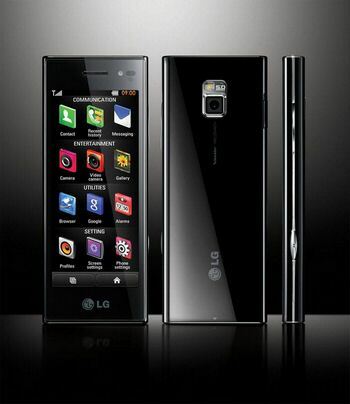 It comes with a glossy black finish casing with 2.4 inch large TFT LCD screen. The TFT screen can display images of 262K colors with 240 x 320 pixels resolution. The pictures in this mobile appear quite bright, clear and colorful. Most importantly, the screen is made of a scratch resistant tempered glass which makes the screen more durable for years. The mobile set weighs only 116g. It feels god when you hold this handset in your palm. It comes with a touch sensitive navigation pad offers effortless navigation to the users. The classic elegance gets noticed by public quite easily. So this is not just a mobile, this is a real pride combined with many useful features itself. The wonderful handset features 5 megapixel camera and the high resolution is highly capable of capturing superb quality photographs without ignoring every minute details of the image. You can also record video footages through the device. 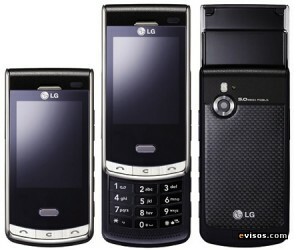 It comes with QVGA camera which can display videos in MPEG4 format. Now you can record every important moment of your life with LF KF750 Secret mobile cam. This hi tech mobile can be a great companion for you in several ways. You can listen to music in the in built FM radio or even download them to make your favorite song collections. LF KF750 provides you ultimate gaming experience. Spend your leisure time playing the Java games which are incorporated into the device and have more fun. Apart from personal entertainment this handset offers several useful attributes which help you to become a successful professional. It gives you fast internet connectivity with great web browsing facilities. You can surf internet WebPages that runs in XHTML and HTML format. Tri-band GSM 900/1800/1900 and HSDPA 2100 provide the users world wide roaming facility. Hence if you are travelling through air and want to stay connected with your business clients during the journey then LF KF750 Secret is the best companion for you. You can send emails, SMS or use instant messenger for speedy communication. As your business network grows it will also facilitate you to store up to 1000 business contacts details for your convenience. The expandable memory will help you to upgrade the memory card whenever you feel the necessity. The mobile set comes with an USB port and Bluetooth. You can transfer all important files, images or audio and video collections to your personal computer with the help of these accessories.